TransFreeze Vol. 3 from Pixel Film Studios is a self animating masking transition. With TransFreeze users can reveal any object or subject with a unique freeze mask effect in FCPX. Each preset features directional animation controls using a drop-down menu. Editors may choose between cut-out first or background first presets with motion blurred options. Creating a dynamic freeze transition has never been easier. TransFreeze Volume 3 provides Final Cut Pro X users the means to create a unique freeze frame transition from one clip to the next. To use “Cut-Out First” presets, choose a video clip and hold the position of the frame you want to freeze with the hotkey “Shift + H”. Next, drag a TransFreeze preset into the FCPX timeline and align it to the frozen frame. Lastly, use the built-in masking tool to cut-out a section in your video footage and compound. To use “BG First” presets, choose a video clip and freeze the first frame of the video using the hotkey “Shift + H”. Use the built-in masking tool to cut-out a section and compound the clips together. Place the compounded clip above a second video file to transition seamlessly. TransFreeze includes a custom masking tool that allows FCPX users to mask out any subject with a few simple clicks. Start by hitting “clear” to reset the points and enable guides. Next, click around the subject to create a custom mask. To add more points on the mask, simply double-click along the bezier. To delete a point, hold down the “option” key & double click. To adjust the curvature of a tangent, double click on the point connecting two vectors. TransFreeze Volume 3 features intuitive customization options that are located in the top-right inspector window. With an easy drop down menu, editors can control the direction of the animation. Creating a dynamic freeze frame transition in Final Cut Pro X has never been easier. With TransFreeze Volume 3, editors can choose between motion blurred and non motion blurred presets. Motion Blur is an animation feature that simulates the illusion of real objects in motion to create a more realistic look and feel. Motion blurred presets can be slightly more render intensive so be patient when you choose to use them in Final Cut Pro X. Where do I find TransFreeze Volume 3? 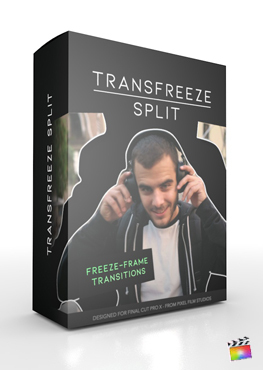 Once the installation is complete, you can find TransFreeze Volume 3 in the FCPX Transitions library.